risk of damaging the product. In any case, in order to prevent accidental damage, advice on methods for handling our products can be found <here>. On request, Jencan can supply the handgrips with the fixing holes already made. Our experience and the machinery we have at our disposal make it possible or our machine shop to supply ready-to-use products at competitive prices. When placing an order please specify the letter which identifies the type of hole you have selected and the measurements required for its execution. This fastening system requires a through-hole for a spring pin. Specify the distance from the hub “hf” and the diameter of the hole. The spring pin is not supplied. NOTE: The hole is not positioned at any particular angle in relation to the handgrip. 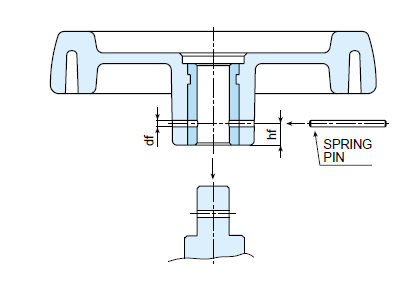 This fixing system requires a threaded female hole for threaded grub screws. Specify the distance from the hub “hf” and the diameter of the threading “Mf”. If several threaded holes are required specify the angle “A” that the holes must have as well. 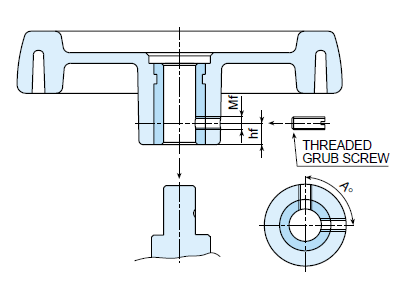 The threaded grub screws are not supplied. NOTE: The hole is not positioned at any particular angle in relation to the handgrip.